& Much more - Try it free for 30 days today! Automatically Record Your Calls, Voice Notes & Much More! 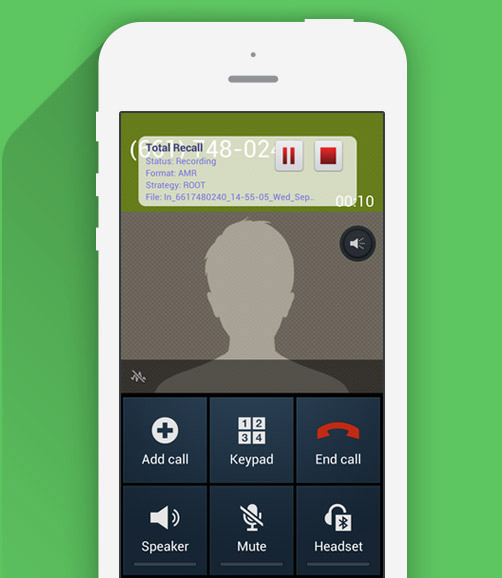 Unlike most other Android call recorders that simply record the call audio from your microphone (at low volumes) Total Recall is designed for TRUE CALL RECORDING, which results in full audio from both sides of the call on compatible devices *. The quality difference is huge. When call recording is truly important, Total Recall is the only Android call recorder uou can trust. Plus Total Recall is backed by Killer Mobile ® a US based developer that's been around since 2003 and contains absolutely no privacy killing spam ads, or tracking code that you'll find in the majority of Call Recording Apps on the Play Store. * Some devices may require root for full, two-sided call recording. Subscribe to our newsletter to be up-to-date with our innovations, new application releases and bugfixes. Builders of truly Killer Mobile ® Apps including Total Recall Cross Platform Mobile Call Recording App, BarSim ™ Bartending Simulator Mobile App & Much More. After you click on the button below, you will be redirected to PayPal to set up the payment. You will then be redirected back to our site to review the order and authorize the payment.